We are one of the leading manufacturers and suppliers of Inkjet Printing Machine. These machines are manufactured using high-grade raw material, which is procured from the authentic and reliable vendors of the market. The machines offered by us are tested on various parameters before dispatching the final consignments so as to offer quality assured products to our customers. Moreover, owing to their longer functional, low maintenance and excellent performance, these machines are widely appreciated and demanded by the customers across the market. Our range includes Computer to Screen Imaging System. Larger image area 20" x 28"
Avail from us a wide gamut of CTS Computer to Screen . The offered product is fabricated by a team of adroit experts, These machines are both automatically and mechanically operated. File security and time to market – Image files can be uploaded to remote production facilities aiding timed distribution and file security. Better control of the process – A fully digital CTS workflow provides better control in terms of product quality and quality assurance. Reduction of processing steps – An average of 10 steps are eliminated with CTS leading to faster turn around times, higher process reliability and fewer remakes. Quality improvement – CTS stencils exhibit wider tonal ranges, better detail and easier print ability of halftones and detail. Even a 600 dpi CTS systems outperform film stencils! Faster printing press set-up – The accuracy of the image placement on the screen allows for much shorter set-up times on press and colour consistency. Maximum Frame Profile 2" x 2.5"
Maximum Frame Size 25" x 36"
Overall Size (L x W x H) 70" x 72" x 49"
We are engaged in offering Computer Screen Imaging Systems. This is also known as Inkjet Engraver. To develop serious cost-reduction plans and implement productivity enhancements, these systems increase digital-imaging speeds and reduce investment costs that is the core reason for traditional screen printing businesses, in order to minimize the inevitable confrontation with digital printing. The systems offered by us maximize the efficiency in prepress and production, as these are manufactured to offer complete solution for screen printers. The SS PROTON system can increase prepress productivity in many segments of the industry. SS-PROTON is fast, precise, cost-effective and easy to use, as compared to traditional, film-based work-flow, which has complicated process from the creation of the artwork till the screen is ready to print. 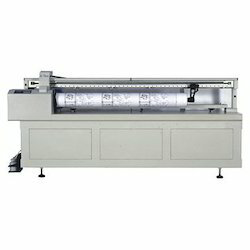 we are providing a wide assortment of premium quality Rotary Screen Printing Machines. 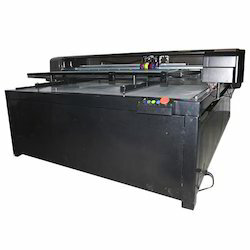 These high grade machines are generally used for the peripheral printing applications. Our products can print up to 3000 impressions per hour depending on the shape that can have the maximum diameter of 5”. Rotary Piezo Screen Printers is used in screen printing Industries, Rotary And Flat Screen Equipment, plate making Equipments and all Type of U.V. Exposing and curing Equipments from last two decades. One set of fixture executes the work of printing; another set of fixture executes the work of loading material and unloading material.